What a year it has been for Lauren Heller Art Consultant! Thank you so much for joining me these past 12 months as I discovered the work of new DC area artists, discussed tips for creating fantastic wall design on a budget, and featured some of my favorite fine art prints that you can purchase on-line. To kick off the new year (and in case you missed them! ), I thought it would be fun to share the 10 most read posts from 2018. ‘TWAS THE WEEK BEFORE HALLOWEEN AND THE TABLE WAS SET! […] Why limit your Halloween decor to orange and black? My whole house is colorful and I wanted to do something that would blend with my every day home vibe. A current #homegoal of mine?? To have a Lanie Mann abstract painting hanging in my home one day! I love her color palette, which somehow manages to be both soft and vibrant at the same time. Her compositions are divine. They feel like spring eternal, as if you’re looking up at the sky through a spray of fluttering cherry blossom petals. The holiday season is upon us and Christmas is right around the corner! As you get your home ready for holiday entertaining this year, don’t forget to spruce up your walls. Here are 6 Super Easy (and Super Festive!) DIY Holiday Wall Art Ideas that you can make IN A DAY. One evening last month, I grabbed my hubby and we headed out towards the Takoma area of Washington, DC. I wanted to check out the opening reception for We Met on Instagram, a group exhibition at Willow Street Gallery featuring the work of 14 artists from the East Coast Art Collective. Need a boost of positivity as you walk out the door? What about a motivating reminder for your home office? Perhaps a calming mantra by your favorite cozy spot? Me too! That’s why I’m excited to share a few of my favorite typography art prints. Time to add a statement piece to your wall (LITERALLY)! Settling into my favorite cushy seat one morning with a perfectly hot and delicious cup of coffee, I started flipping through the Early Fall 2018 Williams Sonoma Home catalog. The oversized pages calling my name with the promise of new design trends, interesting color palettes, and lovely serene interiors. Amidst room after room of delightfully pristine beauty, one space in particular stood out for its tranquil vibe. Two rose-colored velvet swivel chairs anchored this feminine oasis, but over the room’s center mantle, the artwork by Martha Spak resided as the crown jewel. There is a lot of art to look through on the Minted website! 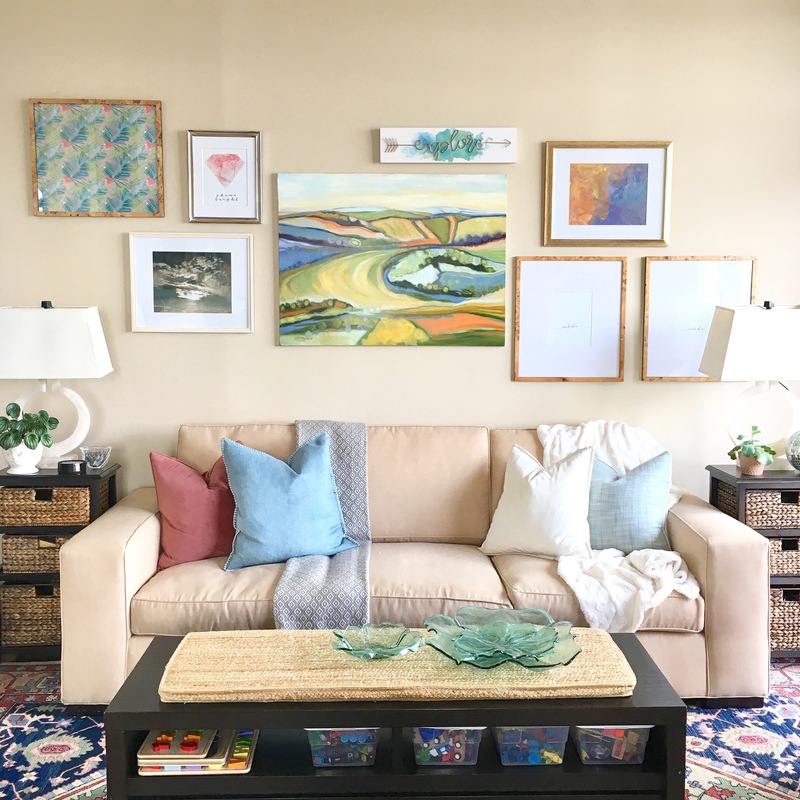 Enter The Gallery Wall Roundup: a curated selection of looks that I’m loving right now that will create a stylish and cohesive wall display. These prints come in a variety of sizes, so you can design the perfect grouping to fit your space! I had so much FUN writing this blog post and am thrilled that readers found it helpful when looking for interesting and unique gifts this holiday season! If you didn’t get a chance to read it, bookmark this one for later because these ideas make perfect birthday gifts for any time of year! HAVE QUESTIONS ABOUT GETTING THE DESIGN JUST RIGHT? CLICK HERE TO CONTACT ME AND LET’S GET STARTED CREATING A “WOW!” WALL IN YOUR HOME TODAY!